Kids are excited about Easter because just like Christmas, children get to receive lots of candies, chocolates and toys wrapped in colorful Easter-inspired basket, figurine, and jars and huggable bunnies. Instead of buying one you can make your own gift or personalized it using ingenious design. If you are good at drawing, you can make colorful sketches on boiled eggs and place them individually in tiny baskets. 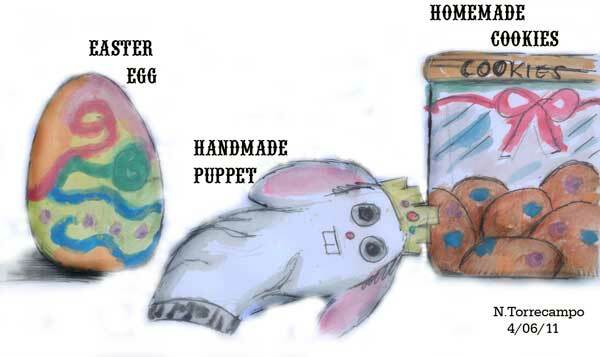 You can make a hand bunny puppet. And bake cookies and place them inside decorative or printed boxes. These are just some easter gifts kids will surely love to receive. This entry was posted in Holiday Food and tagged cheap easter gift, easter gift ideas, easter kids gift, gift ideas easter, top easter gift on April 6, 2011 by Yami.